I was happy to see that a document with “Extended Abstracts” are already out for the Gold18@Perth symposium that is starting today (where Novo among others will be presenting)! Whatever the source was that created the basin wide gold event which later got deposited in the Fortescue Basin, again on a seemingly basin wide scale, there was apparently an “enriching event” after that! The clouds of fine gold, as well as the at least outer layer of the nuggets, got precipitated in a marine environment. There was carbonaceous material found IN the gold cloud. 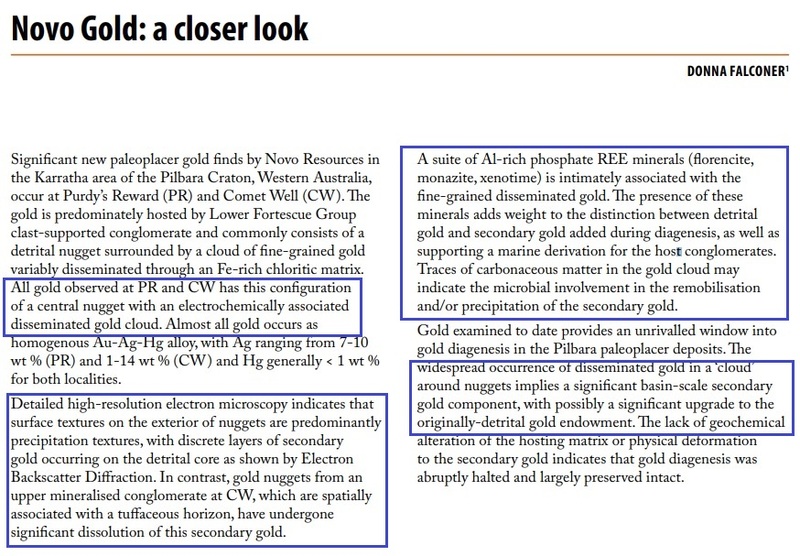 BASICALLY: THE GOLD THAT GOT DEPOSITED ON A BASIN WIDE SCALE ATTRACTED MORE GOLD, WHICH MEANS THAT THE FIRST MAJOR GOLD EVENT WAS FOLLOWED BY ANOTHER MAJOR GOLD EVENT IN SITU…!